Mary Jeanne Arcus joyfully and in peaceful sleep, went to join her husband Don in the loving embrace of our Heavenly Father on July 5th, 2016 at Sylvan Crossings in Jefferson, WI. 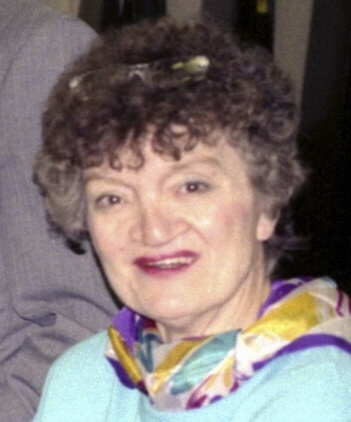 Spirited, determined, witty, fiercely independent, and full of life, all who have known her, from her children, grandchildren, nieces, nephews, students, friends, and her wonderful Sylvan Crossing family, will remember Mary Jeanne as a woman who lived life to the fullest even as her body became frail. She was born on August 23, 1927 in Chicago, Illinois to Walter and Sylvia (Hogdson) Budzik. She married Donald Emmet Arcus on December 26, 1949 in Chicago Illinois and joyfully welcomed seven children into their lives. Mary Jeanne graduated from DePaul University in 1949 with a degree in literature and went on to secure two masters in literature and film studies. Many students from Hoffman Estates and Conant High School where she taught for 21 years will remember her for her vibrant and creative teaching approach. She was infinitely curious about everything, the people and the world about her. She thrilled to travel, go to museums, art galleries, writing groups. She visited London, Paris, and Rome many times and her last visit, she returned to her father's homeland, Tarnobrezg Poland where she was greeted by a cousin and her family. Her husband Donald preceded her in death in February of 2003. Mary Jeanne will be deeply missed by her children: Donald Arcus of WI, Christopher (Bea) Arcus of CA, Yvonne (Eric) Helgeson of CA, Jeaneen (Michael) Dyer of AZ, Amy (Jim) Arth of CA, David Arcus of WI, Antoinette "Toni" (Jeff) Punzel of Fort Atkinson, WI. Grandchildren Kirsten, Tori, Emma, Michelle, David, Phillip, Megan, Matthew as well as her brother Richard (Betty) Budzik of OR and many nieces, nephews, and other family members who will cherish her memory. In addition to her parents and husband, she is preceded in death by her sister Shirley Budzik. Mass of Christian Burial will be held at 11:00 a.m. on Saturday July 9, 2016 at St. John the Baptist Catholic Church in Jefferson with the Rev. Thomas Coyle officiating. Visitation will be at the church on Saturday morning from 10:00 a.m. until the time of Mass. Luncheon following. Burial will be on at 11:00 am, Monday July 11, 2016 at St. Michael Catholic Cemetery in Palatine, IL, Father Paul Stein officiating. "For I am certain that neither death nor life, neither angels nor principalities, nor powers, neither the present nor the future, neither height nor depth, nor any other creature, will be able to separate us from the love of God that comes to us in Christ Jesus our Lord." Romans 8:37-39 Visit www.schneidermichaelisfuneralhome.com to leave a condolence or light a candle in her memory.